Cats are typically very clean and meticulous creatures who would rather pee in an area where they can easily cover it up, so if your cat has taken to urinating outside the litter box or on other areas of your home, you will want to discover why. Read on to explore the possible reasons behind the lack of litter eliminations, how to curb this unwanted behavior and quick tips on cleaning up that nasty pee odour with simple products found in your cupboard. If your cat is not peeing where you want it to, here are some reasons that may be causing that troublesome behavior. Covered Litter Box. We as pet parents may like the idea of having a covered litter box; it keeps the smell and mess contained and isn’t totally unpleasant to look at. But some cats may find the covered litter box too confining and for those timid felines, a covered litter box may feel like a place to get easily trapped or cornered by a more dominate pet. Dirty Box. Have you ever used a gas station’s bathroom? They can be pretty nasty and a place we never want to have to use. Cats feel the same way when their litter is soiled. To keep Kitty happy, be sure to clean the litter box at least once daily (if not twice) and thoroughly wash it once-a-month, weekly if you’re not using a clumping litter. Not Enough Litter. Some cats really like to scratch and cover their mess up. If you only have a sparse amount of litter available inside the box, your feline may seek more suitable material to do her business in. Not Enough Litter Boxes. If you have more than one cat, then you need a litter box for each cat. Experts also recommend having a litter box on each level of your home. The box is Too Small. Try going to the bathroom in an airplane restroom and you’ll know how a large cat feels when he’s going in a tiny litter box. To get the proper fitting box, measure the length of your cat then add another half to that number. Litter Box Liners. The plastic liners designed for a cat box is for the convenience of the pet parent; however, some cats do not like the feel of the plastic on their paws and may snub the box because of it. The same applies to the litter mat, maybe your cat does not like it for one reason or another. Wrong Location. Placement of the litter box should be based on the cat, not the convenience of the household. Avoid putting the litter box in a high-traffic region, where loud appliances are used, near the cat’s food/water or in a damp basement. Wrong Litter. Cats love to go in a soft substrate that feels good on their paws. Some cats also have an aversion to strong scents, so keep it perfume-free and sand-like in quality. Self-Cleaning/High-Tech Litter Boxes. Again, these were made for the convenience of us humans, but the manufacturers didn’t necessarily take into consideration the cat itself. Many of these boxes have a very small litter pan base making it difficult for larger cats. They make loud noises when cleaning which can frighten timids felines and even though they are timed for 10 minutes, if another cat enters immediately, it can be “caught” in the cleaning process. Strong Cleansers. We mentioned earlier about keeping those boxes clean, but using a strong cleanser can be a turn-off to a sensitive kitty nose, Keep cleaner all-natural or on the milder side of the scent-scale. Litter Scatter Mats. These mats are designed to catch the litter as your cat exits the box; however some more sensitive feline’s may not like the feel of these mats and will refuse to even go into the box. If your cat has taken to peeing on your couch or your cat is peeing on your bed, there could also be an underlying health issue that is preventing her from making it to the box on time. Possible causes could be an urinary tract infection which makes it difficult for the cat to hold its pee. In addition, if your cat is a senior and is peeing on the couch or bed, then it may be due to old age incontinence, which is a common occurrence in this age group. Take your kitty to the veterinarian so he or she can rule out any underlying health issues. Has your cat been peeing on the floor for no apparent reason? Then she may be trying to tell you something. Cats are creatures of habit so if their routine is interrupted by a significant change in their environment, this can throw them into a tailspin and can manifest itself with peeing in other places. For example, is there a new baby in the home, new spouse, death of a loved-one or even the addition of a new pet? These can all cause kitty to become stressed enough to seek out other areas to relieve herself. If this is the case, try to pay more attention to your cat to help her feel more loved. If there’s a new addition, be sure to praise your cat around the new addition so she doesn’t feel left out or forgotten about. Have the new spouse feed your cat and give her treats to build feel good moments and to help break the tension and stress she may be feeling. When a cat is declawed it is actually an amputation of the first knuckle. This is a painful operation that may leave your cat with long-term or even a lifetime of sensitivity to harsh textures, the litter can be one of them. 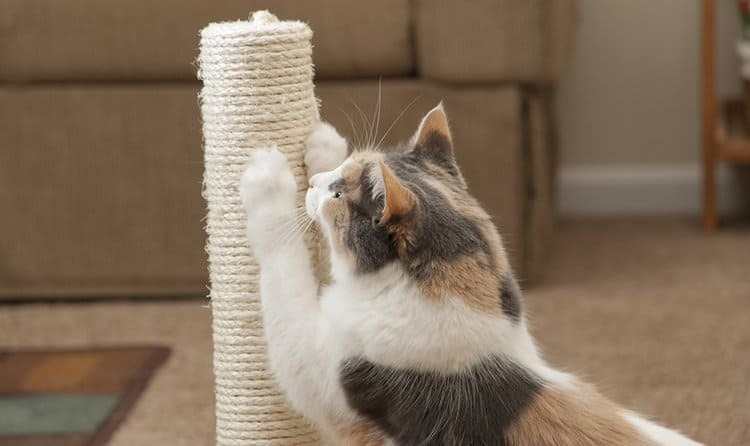 If you are wondering about declawing your cat, Dr. Pam Johnson-Bennett gives us the scoop. Your clothes and other soft textures may not cause your cat as much pain and irritation to her paws, so she will go where she feels the most comfortable. If we punish our cat because she failed to use the litter box, then we may be sending the wrong message. Our cat thinks we object to its elimination, not the area in which she chose to do so. She will also most likely become fearful of us which is not what any good pet parent wants. Just remember our cats aren’t peeing and pooping outside the box to insight our anger, but rather because she doesn’t feel like she can use the box. Our job as good pet parents is to figure out why. An intact male cat that has reached sexually maturity (around 6 to 8 months-old) may spray around your house to mark his territory. This is a common behaviour and one that may be rectified by neutering him as soon as possible. However, some older male cats can continue with this behavior even after they’ve been altered. To prevent this from occurring male kittens should be neutered no later than 6 months-of-age. The best way to combat the smell of cat urine is to locate the mess and thoroughly clean it up. The longer cat pee sits, the stronger the odor becomes, so get on it ASAP. If your feline friend has eliminated on your carpet, this simple home mixture works wonders. Start by blotting up as much of the urine as possible using paper towel or rags. Mix 1 part vinegar with 1 part water. Saturate the spot. Dry thoroughly with clean paper towel or clean rag. Mix ¾ of hydrogen peroxide with 1 tsp of liquid dish detergent. Drizzle this over the baking soda. (Use on a inconspicuous area first to test for fabric discoloration). Work this mixture into the carpet fibres using your fingers or a cleaning brush (a hair brush with plastic nibs over the bristles works well, too). If you still notice an odor after you’ve finished, repeat the process. Although, having your cat pee where it shouldn’t can be annoying, it’s not the end of the world. Explore the reasons why Kitty may be upset about using the litter box and move on from there. If nothing seems to be working, consult your veterinarian or animal behaviorist for other possible reasons and solutions. My cat poops outside the box but pees in it. I have two cats and two boxes and have changed both the boxes and sands. I use only unscented clumping. What can I do to correct this? It’s my female and she has been fixed and is 6 yrs. I have 2 female cats, both are fixed, not declawed, indoor only, when they were kittens they obviously had litter problems, but after training and working with them they were great. Sippa, mancoon and calico, 3 are taking turns peeing on the floor right beside my bed, both of their litter boxes are always clean, I noticed they both still popped in their own boxes, so I put a third one out thinking maybe they are just being snooty and spoiled and want different places to pee and poop, but they go no where near it. no new changes, had them both checked out, nothing health related, boyfriend who they LOVE and he loves them too is now getting pissed off (I don’t blame him) because 60÷ of the time, I’m gone at work when.